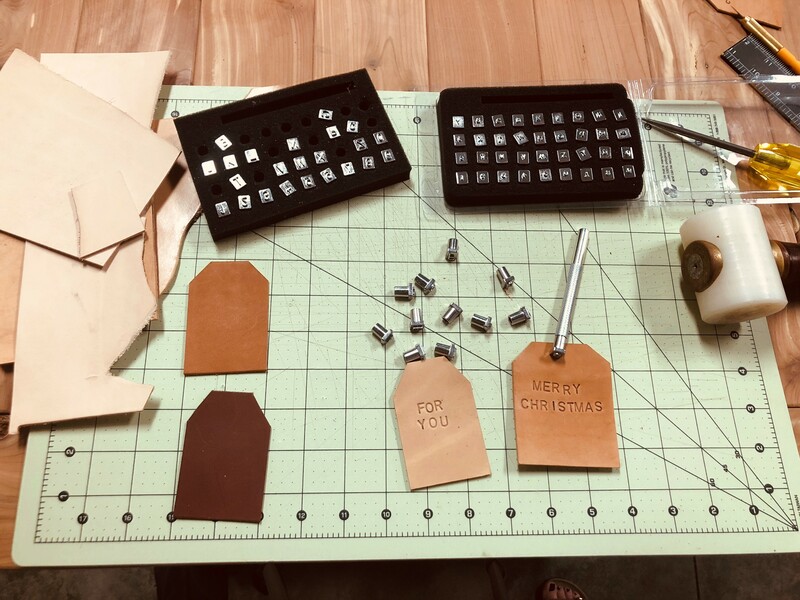 Add a meaningful touch to gifts with these handmade leather gift tags. 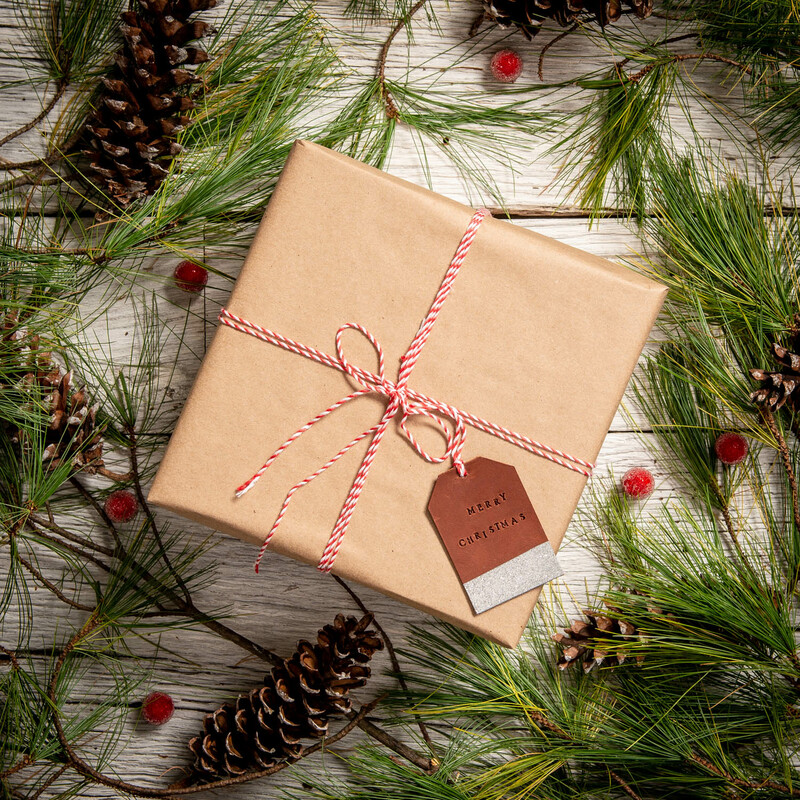 Since Christmas is right around the corner and I personally love all things Christmas, I chose a Christmas theme, but you could add these to any gift, from birthday to anniversary and so much more! In addition, they can be made with whatever scraps of leather you have in your craft box. 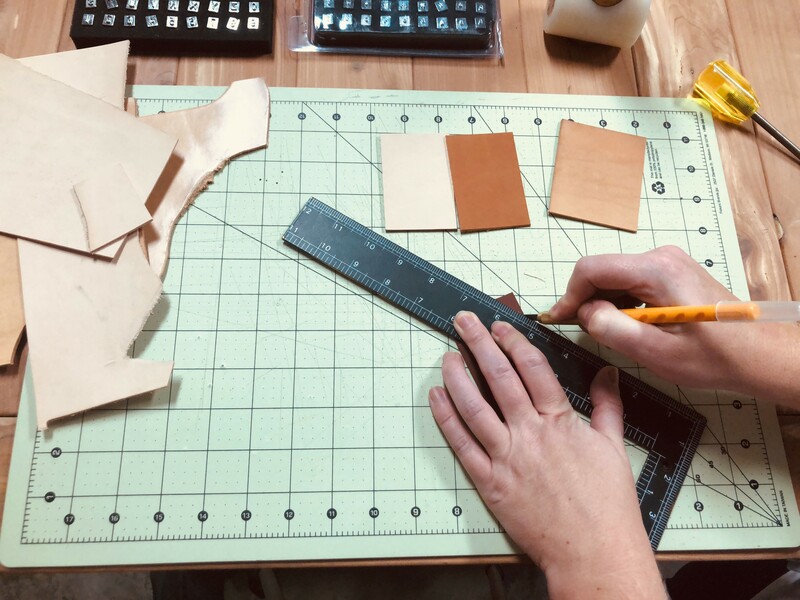 Keep in mind that you’ll want to use veg tanned leather so the stamp impressions stay nice and crisp. 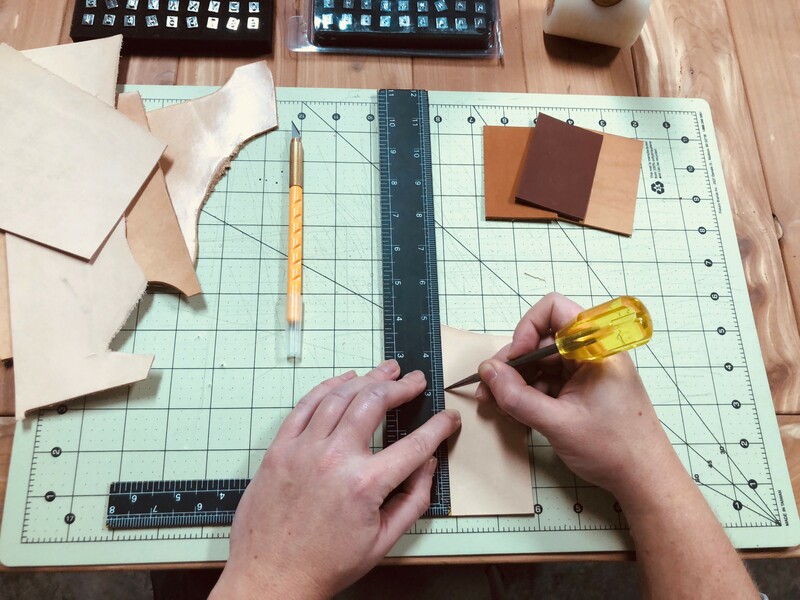 I used English bridle leather and natural veg tan scraps for this project. 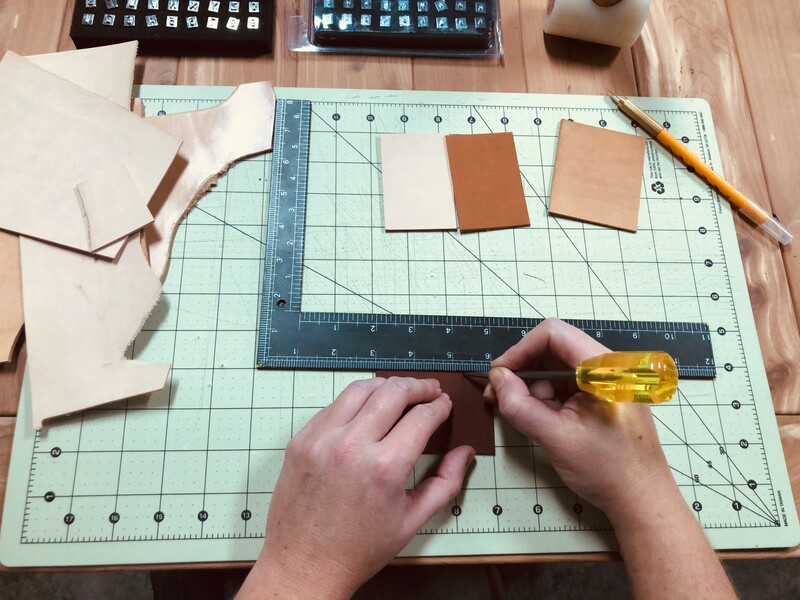 Mark and cut your leather pieces into roughly 2” wide x 3” long rectangles. The size is really up to preference, you can do smaller or larger. 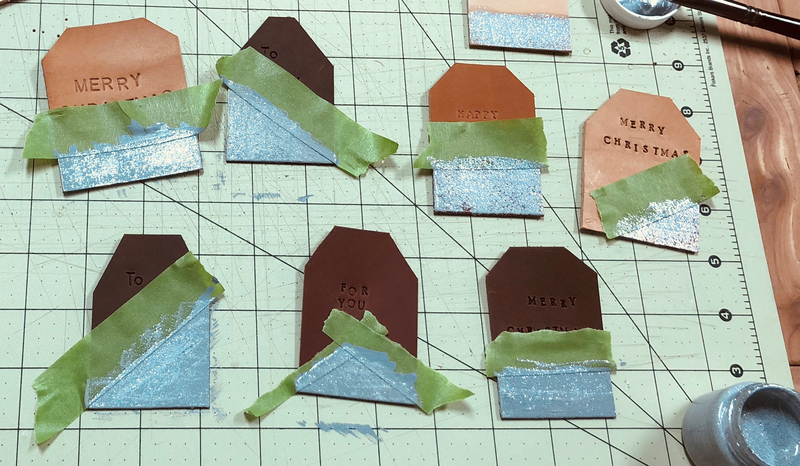 I wanted my tags to have clipped corners, so I measured ½” in on the top and down the sides and cut according to my marks. I varied the measurements a little bit so some tags have a more narrow top. Time to stamp! 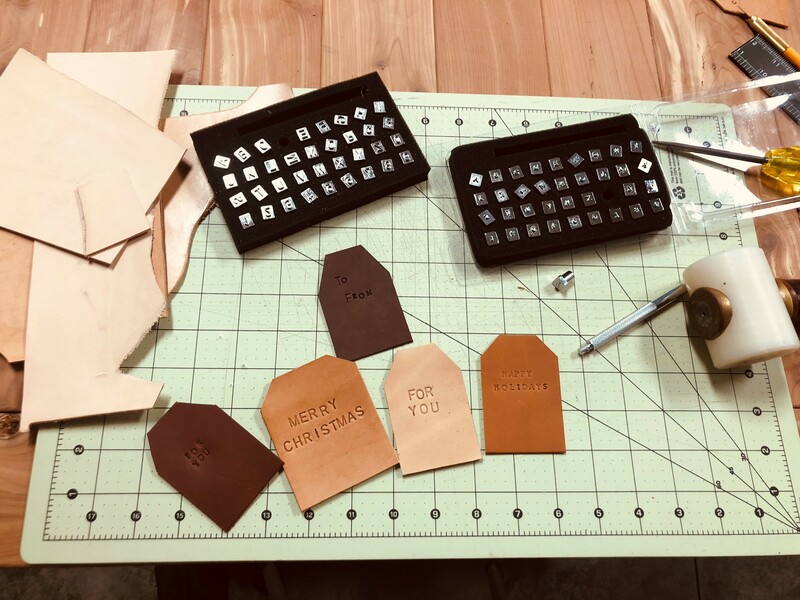 If you are using natural veg tan leather, use a sponge and wet the leather so the stamps will sink in nicely. The English bridle leather does not need to be wetted. I used ¼” and 1/8” letter stamps. Again, this is up to preference. I was also looking for a more rustic look so I did not use a straight edge, I just went for it and I really liked the outcome. Apply dye if desired. 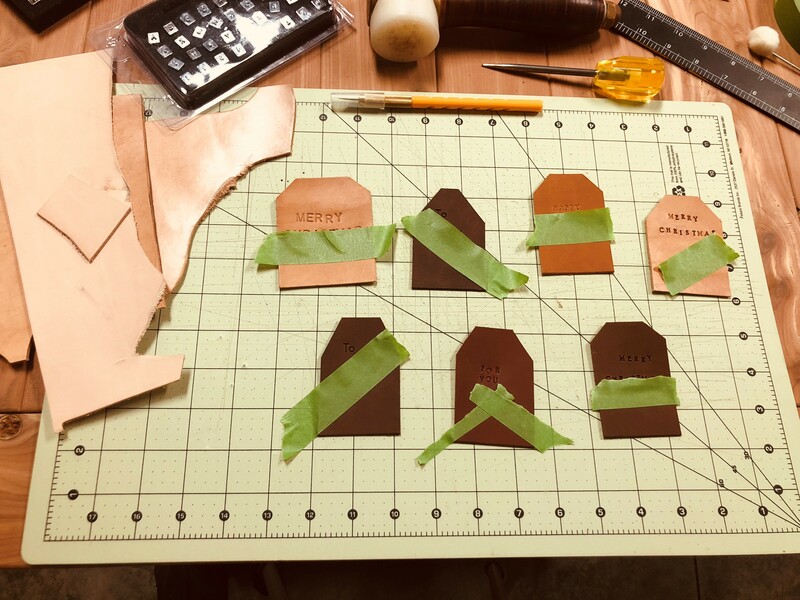 I skipped this step, but if you are using natural leather and you want it darker, now would be the time to dye the tags. We recommend Fiebing’s Pro Dye and you can either dip dye or brush it on. Use Frog tape or painter’s tape to tape off the area you will be painting. You can do straight lines or diagonal. I also did a fun triangle; the sky is the limit. The paint I used was Angelus® Paint in Light Gray and Glitterlites Silver Spark. Putting a coat of paint first and then the Glitterlites on top ensures the glitter covers the leather more evenly. I like a lot of glitter so I did 2-3 coats for maximum shine. I did a few tags with Glitterlites only (top right) and they turned out ok but I do like the ones with the paint underneath better. Step 7: Let the paint dry completely and then remove the tape. Take an art knife or utility knife and make a small slit at the top of the tag. This is where the string will loop through. I used a scratch awl to widen the opening once the slit was cut. Take a piece of string or thread (approx. 8” long), double it and slide it through the opening, bring the ends of the string through the other looped end and pull tight. That’s it! 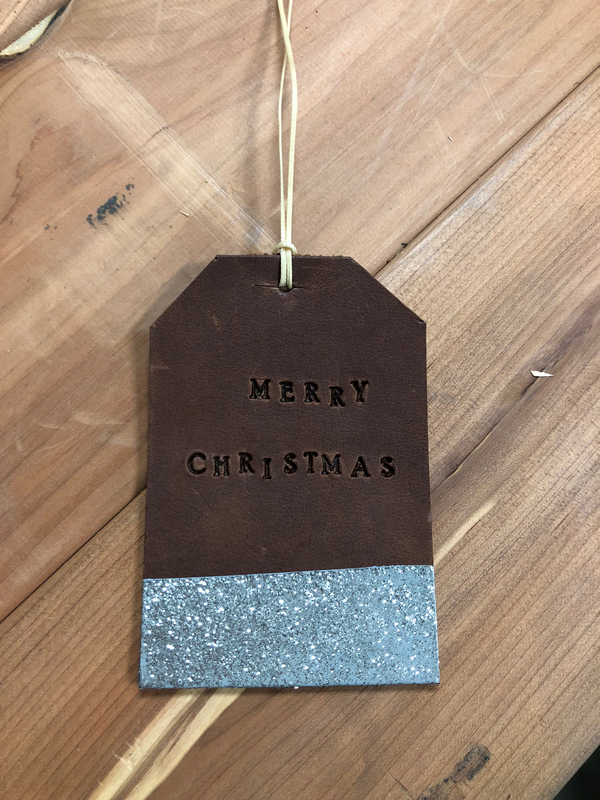 Your tag is ready to be added to a gift. These little guys are so fun and they add a pop of sparkle! Gold glitter would look great also, or a pretty green and red if you’re sticking to the Christmas theme. Have fun with it and add your own personal style.